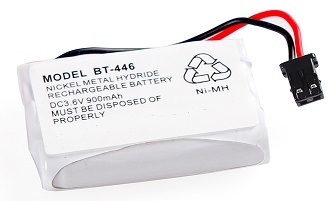 BT-446: 3.6 volt 990mAh NiMH battery (with BLACK connector) for Uniden cordless phones. BT-446: 3.6v 900mAh long life rechargeable NiMH Battery for cordless phones. Fits Uniden, Radio Shack, GE, Bell South, & more. Made with 3 Ni-MH cells and BLACK connector. Replaces BT-446, BT-1005,and more. Replaces Uniden BT-446, BP-446, BT-1005, BT1005, DCT646, DCT646-2, DCT6462, DCT648-2, DCT6482, DCT746M, DCT746, DCT746-2, DCT7462, DCT748, DCT748-2, DCT7482, DCT6465, DCT6465-2, DCT64652, DCT6485, DCT7488, DCT7488-2, DCT74882, DCX700, DCX650, DCX770, DXC700, ELT560 Base, ELBT585 Base, ELBT595 Base, EXT1460, EXT1465, NCP1154, T4 Series, T400 Series, TCX800, TCX860, TCX905, TRU446, TRU446-2, TRU4462, TRU448, TRU448-2, TRU4482, TRU4485, TRU4485-2, TRU44852, TRU5860, TRU5860-2, TRU58602, TRU5865-2, TRU58652, TRU5885, TRU5885-2, TRU58852, TRU8065, TRU8065-2, TRU80652, TRU8866, TRU8866-2, TRU88662, TRU8880, TRU8880-2, TRU88802, TRU8885, TRU8885-2, TRU88852, TRU8888, TRU9460, TRU9465, TRU9480, TCX-800, TXC-146, TXC-400, TXC-580, TXC-860A, UIP1868, UIP1868-8, UIP18688,,BBTY0457001, BBTY0458001, BT446, BP446, DCT-646, DCT-646-2, DCT-6462, DCT-648-2, DCT-6482, DCT-746M, DCT-746, DCT-746-2, DCT-7462, DCT-748, DCT-748-2, DCT-7482, DCT-6465, DCT-6465-2, DCT-64652, DCT-6485, DCT-7488, DCT-7488-2, DCT-74882, DCX-700, DCX-650, DCX-770, DXC-700, ELT-560 Base, ELBT-585 Base, ELBT-595 Base, EXT-1460, EXT-1465, NCP-1154, TCX-800, TCX-860, TCX-905, TRU-446, TRU-446-2, TRU-4462, TRU-448, TRU-448-2, TRU-4482, TRU-4485, TRU-4485-2, TRU-44852, TRU-5860, TRU-5860-2, TRU-58602, TRU-5865-2, TRU-58652, TRU-5885, TRU-5885-2, TRU-58852, TRU-8065, TRU-8065-2, TRU-80652, TRU-8866, TRU-8866-2, TRU-88662, TRU-8880, TRU-8880-2, TRU-88802, TRU-8885, TRU-8885-2, TRU-88852, TRU-8888, TRU-9460, TRU-9465, TRU-9480, TXC146, TXC400, TXC580, TXC860A, UIP-1868, UIP-1868-8, UIP-18688, UIP1868P (VOIP), UIP1869V (VOIP), WXI477, etc.